I’ve been doing some rereading this summer, something I haven’t done much of since I was a teen and read The Outsiders a countless number of times. 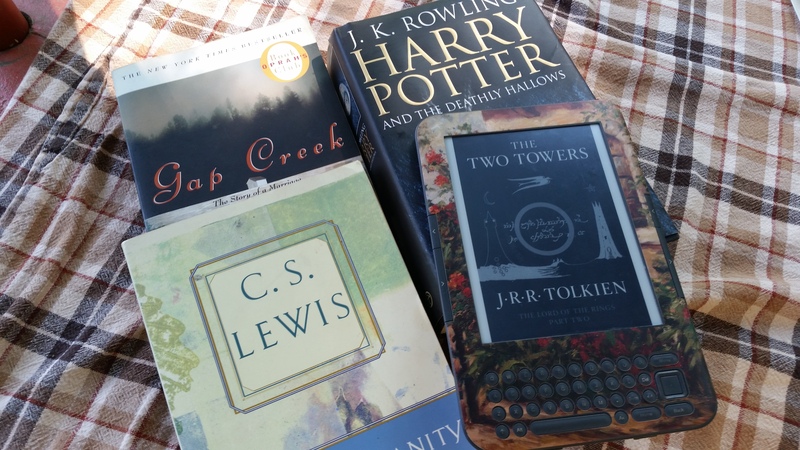 I’ve seen the subject discussed on goodreads, and recently read another blog on the subject, so I thought I would share my own recent experiences in rereading, including the rereading I have been doing this summer. I would love to hear from others on what they reread and why. I know most of you readers are like me and feel that with “so many books to read, so little time”, how can anyone possibly justify rereading? Well, there are several reasons, but read on for mine. First, let me mention a legitimate fear in rereading and that is the possibility of returning to a book you enjoyed at an earlier time, but when you reread it, you’re disappointed and wonder ‘what in the world did I see in that book?’ Obviously, we are different people at different times and usually a book will mean different things to us at different times. However,the well-written book will stand the test of time, even if it means something different to us upon rereading. A series of books I recently reread was the Harry Potter books. I know; almost a cliche. I don’t know how many times my five kids have reread those books. I read them the first time as they came out; before they were a cult, a fad, a part of our culture. I bought the first one for my oldest son (now 23) and began reading it to him; though a few chapters in, he took it upon himself to read it alone. A couple of years ago, I decided I wanted to see the movies because I had only seen a couple of them, (having stayed home with “the babies” when the first ones came out, and my husband took the oldest ones to see them). Now, with the “baby” being 13, I told him I wanted to watch the movies with him, but only after I read the books. So, we would reread a book, then watch the movie together. So, I reread this series for two reasons. One: I wanted to see the movies, but not without returning to the books first (and in most cases, I don’t know how you know what’s going on without reading the book first). Two: to spend time with my son doing something we both enjoyed. This summer I find myself rereading several books in different genres for different reasons, though they all boil down to the simple reason of: I want to. I am currently rereading Lord of the Rings. I have read this several times, but probably not all three in over 20 years. It was just time. I’m rereading Gap Creek by Robert Morgan. I read this several years ago and enjoyed it for his beautiful writing and because I know the characters lived a lifestyle shared by my own grandparents and great-grandparents, and I find this fascinating. I have wanted to reread it for awhile, but having bought Morgan’s sequel The Road fro Gap Creek, I decided this was the time. Two other books I am rereading this summer are about as different from each other as possible. The first is Bill Bryson’s A Walk Through the Woods. One of the few books that my husband and I have both read. We agreed it would be good to reread this before the movie comes out. Two chapters in, I am already laughing and glad I found a used copy on AbeBooks. The other book is Mere Christianity by C.S. Lewis. I first read this in college and have probably read it a couple of times since. My apologetic skills are weak, so I knew this deserved a reread before I tackled some new books in that area. What about you? Are you doing any rereading this summer?